BIRMINGHAM, Ala. – Non-steroidal anti-inflammatory drugs, or NSAIDs, are widely known as pain-killers and can relieve pain and inflammation. However, prolonged use raises the risk of heart and kidney failure events. A heart attack causes death of heart muscle cells by lack of oxygen, and it also significantly injures the kidneys. To understand the molecular and cellular mechanisms of action that damage the heart and kidneys at the same time — known as cardiorenal syndrome — University of Alabama at Birmingham researchers pretreated animals with the NSAID carprofen in a mouse-heart attack model. Basic research on heart disease is needed because heart disease is the leading cause of death for both men and women, according to the Centers for Disease Control and Prevention. 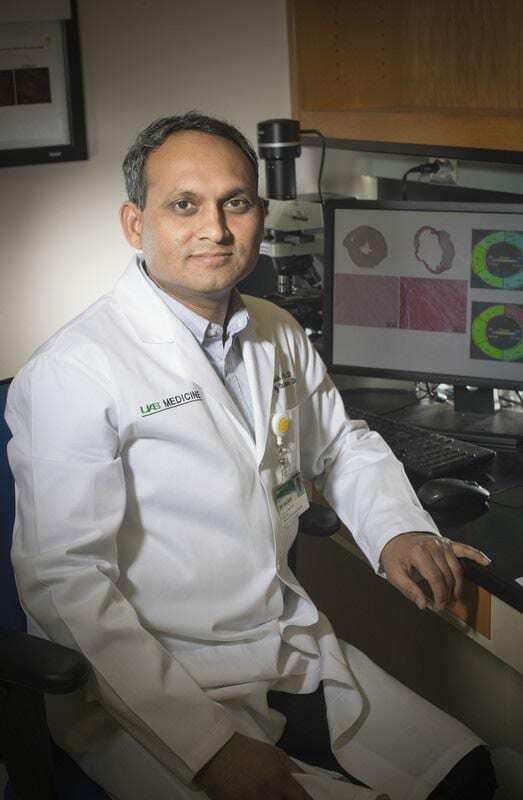 Ganesh Halade, Ph.D., associate professor in the UAB Department of Medicine’s Division of Cardiovascular Disease, wanted to see if carprofen affected either of the two steps the immune system takes to repair heart attack damage. First is an immediate acute inflammation, where leukocytes rush into heart muscle to remove dead cells and cell debris. Second is the subsequent resolution phase to dampen the excess inflammation caused by those activated leukocytes, which otherwise would further damage the heart and kidneys. Third, when the pretreatment with carprofen was followed by heart attack, the proinflammatory cytokines TNF-alpha and IL-1-beta decreased, rather than increasing as they do in response to heart attacks without carprofen pretreatment. KIM-1 showed a similar dysfunction — it stayed at similar levels at both pre- and post-heart attack after carprofen pretreatment, rather than increasing as it does in response to a heart attack without carprofen pretreatment. This KIM-1 dysfunction led to less clearance of dead cells from the heart. Also, carprofen pretreatment and heart attack amplified subsequent kidney tissue damage, as compared with kidney damage after heart attack alone. Co-authors with Halade for the study “Pretreatment of carprofen impaired initiation of inflammatory and overlapping resolution response and promoted cardiorenal syndrome in heart failure” are Veena Krishnan, David Booker, Gabrielle Cunningham, Jeevan Kumar Jadapalli, Vasundhara Kain, Ph.D., and Amanda B. Pullen. Support for the research came from National Institutes of Health grant HL132989, American Heart Association postdoctoral fellowship POST31000008 and the UAB-UCSD O’Brien Core Center for Acute Kidney Injury Research, which is supported by NIH grant DK079337.